ACC’s super-premium, short-grain rice is a tasty blend of Japanese rice varieties which are perfectly suited to the Central California climate. The firm, short and sticky grains are the preferable consistency for most traditional Japanese dishes, notably sushi. The large, round kernels hold their firmness for long periods of time. The flavor is bold and nutty. 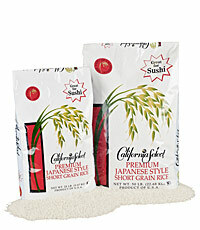 This rice is also perfect for creamy rice dishes such as risotto and rice pudding. ACC is widely recognized as the largest producer of high quality short grain rices in the United States.